The title of the article says it all – Pippa Middleton is enjoying the perks of her royal connections to secure another writing job. 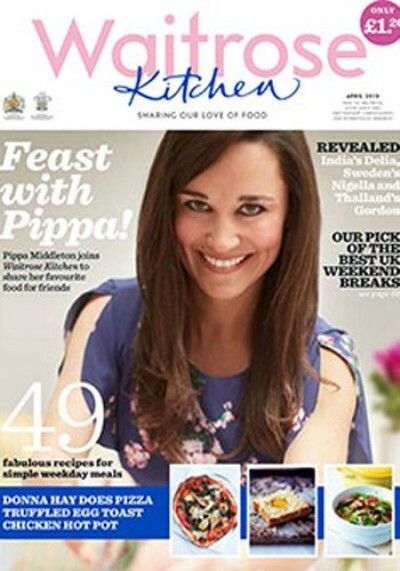 This time, she’s penning a column called “Pippa’s Friday night Feasts” for Waitrose Kitchen magazine. People are pissed, as they should be. Pipsqueak only got her 6-figure book deal because of who her brother-in-law is, and she only got offered this writing position for the same reason. There’s no way in hell she would’ve gotten it based on the pearls of wisdom she dispensed in Celebrate. The royal family should be stopping these social climbing Middletons. No other commoner in-laws are seen this much. No one else in the royal family has commoner in-laws who blatantly capitalize on their royal in-laws. It’s no coincidence that shortly after Kate Middleton’s pregnancy was announced, her mother Carole Middleton introduces a line of “Little Prince” and “Little Princess” party supplies for the family company Party Pieces. Waitrose is going to face backlash for their hiring of Pipster. People are threatening to boycott buying groceries from there. They’re sending letters of outrage over Pippa joining the team. The comments in the articles about are a clue as to what a bad idea this was on Waitrose’s part. They have seriously misread their customers desires this time. The public are incensed at these obnoxious Middletons and Pippa’s bum being forced down their throats by the fawning press (whom we all know the Middletons keep in their pocket to drum up good PR when they need it – especially when Kate was dating and getting dumped by Prince William). When are Willy and the rest of the royal family going to wake up and see what the rest of the world already has – that he made a disasterous mistake by marrying a Middleton? Kate Middleton Scandalous Shocking Photos – Is the Duchess of Cambridge A Royal Fake? Pippa Middleton Husband Hunting During Royal Family Boxing Day Shoot?